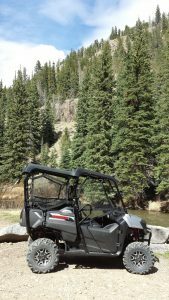 Trail Description: Newly completed in 2015 this is one of the best ATV trail riding experiences in Pagosa. It is approximately 40 miles in length. The loop is comprised of approximately 15 -20 miles of trail and 15 – 20 miles of forest service roads. This trail has it all. There are some very steep and narrow sections and lengths of loose rock, and areas that become slick when wet. There are also areas that are very wet and swampy and some roads that have deep ruts. Driving this trail in spring to early summer can be challenging because of slick areas and a few stream crossings. 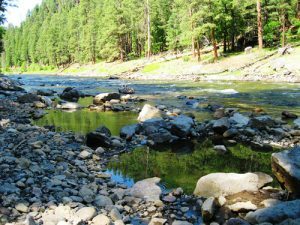 Along the way there are several areas of interest, such as the Turkey Springs Guard Station, Devil Mountain Lookout Tower, and of course the best of all, Piedra River Hot Springs. This is a natural hot spring that is on public land (that means free!) that flows out near the edge of the Piedra River about a 1 mile walk each way from the trail head. 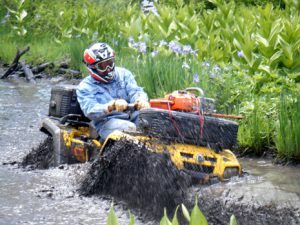 You cannot take a UTV or ATV vehicle down the trail to the spring itself. You must park at the trail head and walk down to the river. Allow at least 2 hours for this side trip as hiking out (up) takes a lot longer than hiking in. You will want to leave extra early (on the trail no later than 8:00am) so you can take advantage of this unique experience. Regardless of whether or not you decide to take the hot spring side trip, you will need to start early (before 9:00 am) if you hope to get back by 4:00 pm. If you don’t want to be rushed, then we recommend just riding out to the Devil mountain tower, Chris mountain loop and numerous routes in the Turkey Springs trail system. Trail Restrictions: Sections of this trail (15 miles) are limited to ATV’s / UTV’s and motorcycles that are 50” or less in width. No vehicles are allowed on the trail that exceeds 50” in width. 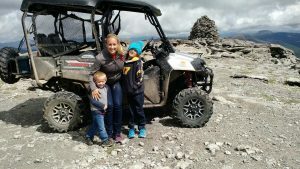 Our Honda Ranchers, Pioneer 2 seater side by side, and our Can Am Outlander 2 Up ATV machines are the only vehicles in our fleet that meet this requirement. Our 4 and 6 seat vehicles are permitted to operate only on forest service roads in this route and do not connect. Distance to Trail Head: The parking / unloading area is approximately 7 miles (15 minute drive each way) from our location. Trail Description: NOTICE, CAUTION! 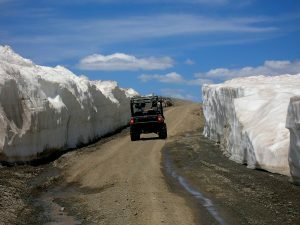 This 4×4 trail is the “real thing” and the best UTV or ATV off-road experience in the Pagosa Country area. The parking / unloading area is approximately 10 miles from our location via highway 160 east, then turn right on East Fork Road (FR 667). The dirt parking area is approximately ½ mile in on the left just past the cattle guard. The road climbs about 18 miles to the top of the Continental Divide / Elwood Pass (elevation 11,500 feet.) and meets with an FR380 access road just east of the divide. 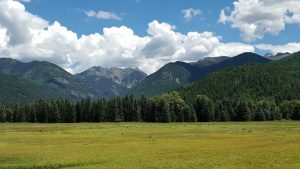 The first 8 miles of the trail are on a somewhat maintained forest service road that meanders through the breath taking East Fork River valley. Some of the best trout fishing in Pagosa country can be found in this canyon along with the spectacular Silver Falls (6.5 miles in on the left at the old forest service cabin). The trail to the falls is a short but steep ¼ mile and there is a sign and parking area just past the cabin. Just remember there is a 4 mile section that is private land. Stay on the road until off the ranch property. There are several shallow river crossings on this section of the trail that are easily navigated during low water. Once you reach the split for Quartz Meadows (approximately 8 miles in) the road turns into a different beast. There are two more crossings of the East Fork River that are impossible in the spring when snow melt-off makes a raging torrent of the river. Do not attempt in this condition. Later in the summer, the crossings are passable with four-wheel drive and high clearance. Just beyond the second crossing is a sharp right turn and an immediate steep climb; be prepared, stay to the inside and don’t stop. There are many other steep and rocky climbing sections along the way and these can be treacherous when wet. Near the top, right at timberline, the road flattens out and mud can be a problem when it’s wet. This is a 36 mile round trip just to the top of Elwood Pass and back. Once on top, there are a lot of interesting things to do. Take a left on FR 380 and visit the abandoned mining town of Summitville. Take a right and head down to the seasonal mountain town of Platoro and get a burger, or fish the tail waters of the Platero Dam. Trail Restrictions: There are no width / vehicle restrictions on this road. PLEASE NOTE: DUE TO THE EXTREME NATURE OF THE UPPER SECTION OF FR 667 EAST FORK ROAD, WE REQUIRE A $50 PREMIUM FEE IN ADDITION TO YOU DAILY RENTAL RATE AND A LARGER SECURITY DEPOSIT OF $2500 PER MACHINE. THIS IS TO COVER THE EXCESS WEAR AND TEAR ON EQUIPMENT. Distance to Trail Head: The trail head / unloading area is approximately 10 miles (20 minute drive each way) east of our location. Trail Rating: We give this road an overall difficulty rating of 4.5 out of 5. Please take note, this trip is only suitable for drivers with extensive experience operating ATV / UTV off road type vehicles. The first 8 miles are relatively easy but the upper 10 miles will challenge even the best riders. Every year there are injuries and equipment damage is a definite possibility. Loss of life has occurred on this road as recently as 2016. If you decide to go to Summitville or Platoro, add on an additional 20 -30 miles. You definitely want to consider purchasing the extra hour of rental time for this adventure. This route would also make an excellent overnight trip as there are endless exploration opportunities once you get to the top of the pass. Check out our multi-day ATV / UTV rental discounts. The last thing you want to do is try rushing back down East Fork Road when you are tired at the end of the day, and we guarantee, you will be tired. Trail Description: This is a fun ride, it doesn’t go anywhere important but is a “roller coaster” type ride with enough challenge to keep you awake. This trail goes through Kit Carson’s old hunting grounds. 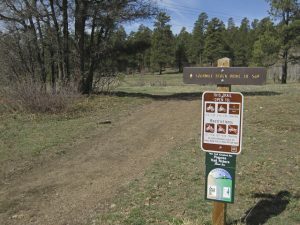 The trail is about 13 miles long each way and connects The Blanco Road, 7 miles south of Pagosa to the Buckles Lake Road near Chromo, Colorado. There is a crossing of the Blanco River that can only be done after spring runoff season is over. The trail can be muddy in wet weather. 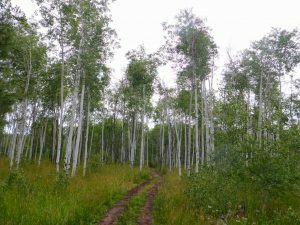 The terrain varies from Ponderosa Pine forest to beautiful Aspen thickets. The Average elevation is about 8000 to 9000 feet. There are some shorter 4×4 trails off the main route to try as time allows. This is a 20 – 30 mile round trip depending on how many side trails you decide to explore. Blue Creek mud hole – Go Around!!! Trail Restrictions: There are no width or ATV or UTV vehicle restrictions on this trail. Distance to Trail Head: The trail head / unloading area is approximately 9 miles south of our location via highway 84, then turn left on Blanco Road (CR 326) and go for 2.5 miles, then right on Blue Creek (FR 012) for less than a mile to the end. Drive time 25 minutes each way. Trail Rating: This is a great trail if you are an intermediate level driver. We give this trail a difficulty rating of 3. However, loss of life has occurred on this trail in the past, and some of the mud holes are deep enough to flood the machine and cause irreparable / costly damage. If you are not sure how deep it is, go around! Trail Description: This is an alternate route to the top of Elwood Pass. This is a great way to access the Elwood Pass area without having to go up East Fork Road or cross the river during high water. Tucker Ponds road FR390 (Pass Creek) runs about 9 miles and eventually ties in with FR 380 (Park Creek). From there, take a right and you will have access to explore the abandoned mining town of Summitville (9 miles), Greyback Mountain summit (15 miles) or drive 19 miles to the town of Platoro and have lunch (great burgers). We give this route an overall difficulty rating of 3. However, please remember don’t take your eyes off the road too long to look at the scenery, as there are several areas where the road drops off several hundred feet and there are no guard rails up here. There is also an endless network of more challenging side trails that are waiting to be explored. The only limitation is time. Trail Restrictions: There are no width or ATV or UTV vehicle restrictions for this route. 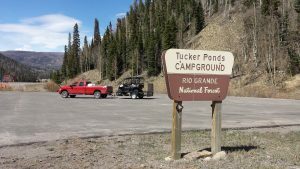 Distance to Trail Head: You must drive up and over Wolf Creek Pass via highway 160 East (29.4 miles / 35 minutes) and turn right into the paved parking / unloading area that is the beginning of Tucker Ponds Road (FR 390). EarlY in the season Tucker Ponds access maY be closed due to snow. 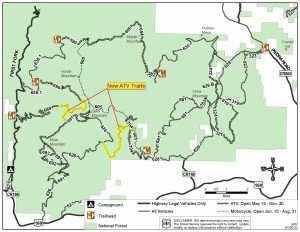 You can drive an additional 6 miles to Park Creek Road (FR 380). This road is maintained Year round and will give You access to SummitVille and beYond. Difficulty Rating: We give this route an overall difficulty rating of 2, but some of the side trails are a little more difficult. However, please remember don’t take your eyes off the road too long to look at the scenery, as there are several areas where the road drops off several hundred feet and there are no guard rails up here. This is a 30 to 60 mile round trip, depending on where you decide to go. Please factor in at least 30 – 45 minutes each way for transport of the machine. 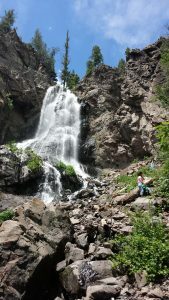 You will likely want to stop at the top of Wolf Creek Pass or Treasure Falls along the way and get a picture. On the other side of Wolf Creek Pass to our north is the equally impressive Rio Grande National Forest with 1.8 million acres of National Forest and arguably some of the best 4×4 routes in the country. This is our favorite overnighter type trip. 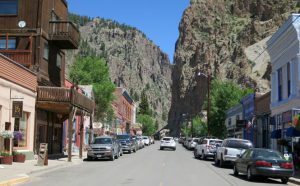 We usually leave the evening before and reserve a room in Creede which is about 70 miles from Pagosa via highway 160 and then turn left on hwy. 149 in South Fork, which will take you to Creede. We try to leave fairly early the next morning and trailer the vehicles about 20 miles to the Rio Grande Reservoir trail head. Yes, this is where the actual Rio Grande river starts. This trail is one of the best in the country. It runs the entire length of the Rio Grande river up to the top of the pass (you will actually cross the head waters on your way to the top). 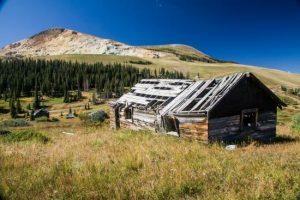 Once you unload, it is about a 4 -5 hour trip up and over Stony Pass (12,592′), down Cunningham Gulch, through the abandoned ghost town of Animas Forks and finally into the town of Silverton. You can drive right into and around town with the ATV / UTV. 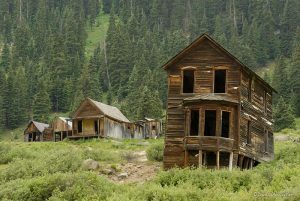 An icon of the infamous Animas Forks ghost town, the venerable hotel stands sentinel over the former mining town. 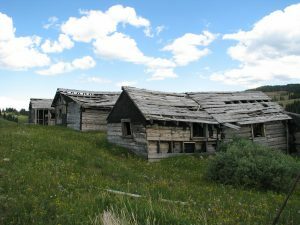 Founded in 1873, Animas Forks was a bustling community of 450 people by 1883. In 1884, 25 feet of snow buried the town and residents tunneled from one building to the next. 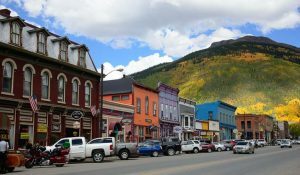 Once in Silverton we will check in to our hotel or campground, get cleaned up, and then enjoy a hot meal at any of the local eateries in town. The next morning we will head back over the pass, load up and be back in Pagosa by 4:30 These are longer trips and require more planning but well worth it. Any trips to this area typically require multi-day ATV or UTV rentals. 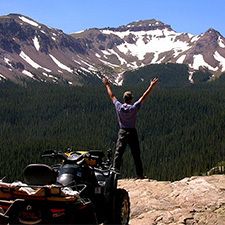 Make sure to check out our multi-day ATV / UTV rental discounts. The opportunities are as incredible as the scenery itself. 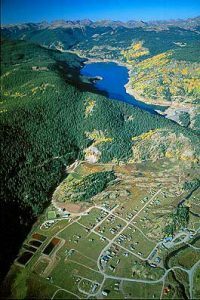 Fishing, camping, hiking, waterfalls, acres of wild flowers, abandoned mines and mining towns to name a few. If this is something that interests you, please contact us. We would love to help plan a trip for you. We have extensive experience exploring our sister forest just to our north. Drive time to trail heads in this area vary from 1 to 2 hours from Pagosa Springs.